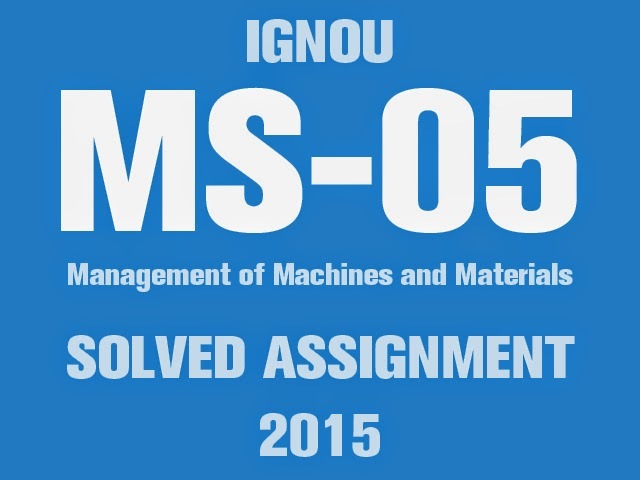 IGNOU Management Programme students can download MS-05 Solved Assignment 2015 for free exclusively on myignou.in. Management of Machines and Materials (MS-05 or MS-5) can be directly downloaded by clicking on the following download button below. To get other solved assignments like our facebook page. 1. Explain in detail the framework of planning, organizing and control decisions in production systems. Give suitable examples to explain the framework. Ans. : Planning is the function of management that involves setting objectives and determining a course of action for achieving those objectives. Planning requires that managers be aware of environmental conditions facing their organization and forecast future conditions. It also requires that managers be good decision makers. Planning is a process consisting of several steps. The process begins with environmental scanning which simply means that planners must be aware of the critical contingencies facing their organization in terms of economic conditions, their competitors, and their customers. Planners must then attempt to forecast future conditions. These forecasts form the basis for planning. For efficient, effective and economical operation in a manufacturing unit of an organization, it is essential to integrate the production planning and control system. Production planning and subsequent production control follow adaption of product design and finalization of a production process. Production planning and control address a fundamental problem of low productivity, inventory management and resource utilization. Production planning is required for scheduling, dispatch, inspection, quality management, inventory management, supply management and equipment management. Production control ensures that production team can achieve required production target, optimum utilization of resources, quality management and cost savings. • It ensures that optimum utilization of production capacity is achieved, by proper scheduling of the machine items which reduces the idle time as well as over use. • It ensures that inventory level are maintained at optimum levels at all time, i.e. there is no over-stocking or under-stocking. • It also ensures that production time is kept at optimum level and thereby increasing the turnover time. • Since it overlooks all aspects of production, quality of final product is always maintained. • To ensure right quantity and quality of raw material, equipment, etc. are available during times of production. • To ensure capacity utilization is in tune with forecast demand at all the time. • Organization can deliver a product in a timely and regular manner. • Supplier are informed will in advance for the requirement of raw materials. • It reduces investment in inventory. • It reduces overall production cost by driving in efficiency. Production planning takes care of two basic strategies’ product planning and process planning. Production planning is done at three different time dependent levels i.e. long-range planning dealing with facility planning, capital investment, location planning, etc. ; medium-range planning deals with demand forecast and capacity planning and lastly short term planning dealing with day to day operations. • It maintains standard of quality through the production life cycle. Production planning and control are essential for customer delight and overall success of an organization. Share " Download MS-05 Solved Assignment 2015"
Share this page ( Download MS-05 Solved Assignment 2015) to let others know about it! Do u have solved assignment of MS-04??? Kindly provide MS-08 solved assignments too. In need of it desperately !